The average co-op closing timeline in NYC from the time you are in-contract is two to three months. However, there are a number of factors which can influence how long it takes to close on a coop purchase in New York City. In this article, we comprehensively explain the timeline for buying a co-op apartment in NYC. We also share a few case studies of nightmare slow co-op closings in NYC. What is the average co-op closing timeline in NYC? How long does it take to close on a sponsor co-op in NYC? How long does it take to close on an all-cash co-op purchase? How long does it take to close on a coop after board approval? How long does it take to get co op board approval? 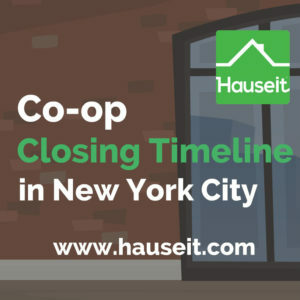 The co-op closing timeline in NYC takes two to three months from the time you have a signed purchase contract. 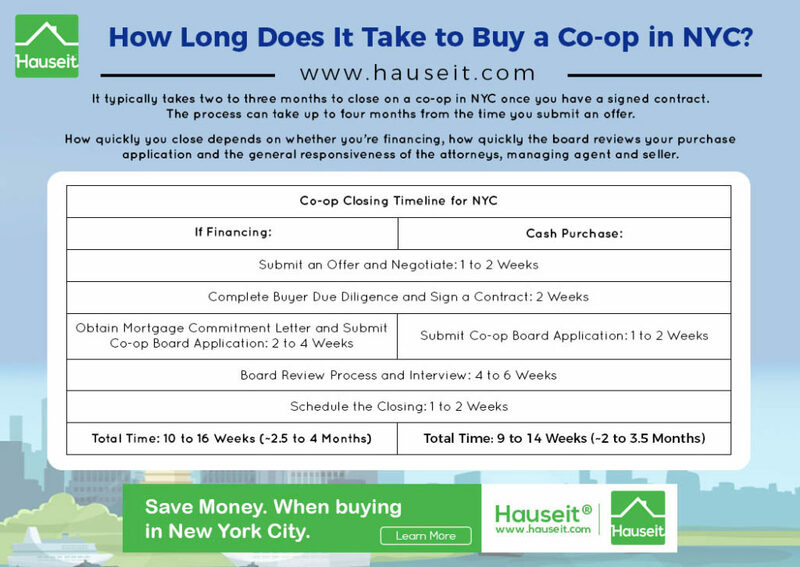 The true length of time it takes to close on a co-op in NYC depends on a number of factors, many of which are outside of your direct control as the buyer. If you are making an all-cash purchase or buying a sponsor apartment, it can take two months or less to close. A typical financed deal usually takes at least three months to close. What most co-op buyers in NYC don’t know is that the length of time it takes to close is largely determined by the co-op board and its managing agent. In other words, submitting your co-op board application quickly or buying a co-op in an all cash deal does not guarantee a quick closing. Working with a seasoned buyer’s agent on your co-op purchase can also increase the chances of a swift and smooth closing. Better yet, you can save thousands and reduce your closing costs by requesting a buyer agent commission rebate. Rebates in NYC are generally considered to be legal and tax-free. It typically takes between two to three months to close on a sponsor co-op apartment in NYC. Sponsor units are desirable because they usually do not require the buyer to undergo the traditional co-op board approval process. Although the buyer of a sponsor apartment cannot be rejected, the buyer is usually required to fill out an abbreviated board application. Sponsor co-op apartments typically have a shorter board application which takes less time for the buyer to complete and submit. If you are financing the purchase, you will need to secure a bank commitment letter before submitting your purchase application. Therefore, sponsor sales usually only close faster than traditional co-op apartments for buyers who are all-cash. Similar to co-op sponsor units, condos also usually require the buyer to complete a brief purchase application. A condo can only reject a buyer if it exercises its right of first refusal and agrees to buy the apartment on the same terms as proposed by the purchaser. PRO TIP: Sponsor sales (and new construction) have higher buyer closing costs compared to traditional private resales. The bulk of the higher closing costs come in the form of the NYC Real Property Transfer Tax (RPTT) and the NYS Transfer Tax. Whereas for a traditional resale the seller pays these taxes, for a sponsor sale these taxes are usually paid by the buyer. An all-cash co-op purchase in NYC typically takes 1.5 to 2.5 months to close. 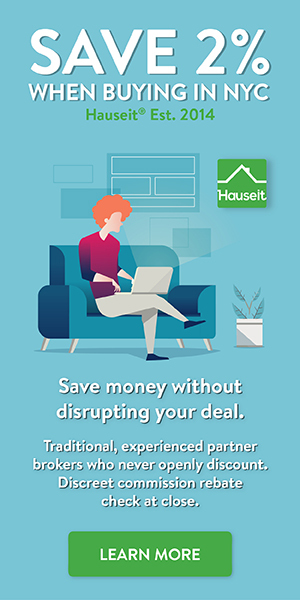 Although it’s more common for cash deals to take up to two months to close, it’s not unheard of to close within six weeks if you are buying into a smaller building with a responsive board. The main advantage of a cash vs. financed co-op purchase is the fact that the buyer does not need to obtain a mortgage commitment letter before submitting the board application. This means that a buyer can submit the board application as soon as possible without having to wait two to four weeks to receive a bank commitment letter. The timeline for receiving a mortgage commitment letter varies by bank and the size of loan. If you are applying for a ‘jumbo’ loan, banks typically send the loan to two underwriters (instead of one) for a review. Your mortgage commitment letter can also be delayed as a result of the appraisal or the co-op questionnaire. 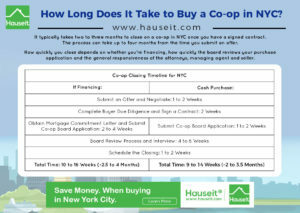 It typically takes two to three weeks to close on a coop after board approval in NYC. Most co-ops will issue a decision within a few days of conducting the board interview. The closing date itself usually happens within two weeks of receiving official notice of board approval, although there is no law which says how soon the closing must occur. The vast majority of co-op boards issue a decision the morning after the interview. However, there are always exceptions such as in our second case study below. In that example, the board took six weeks to approve the application after the interview. The scheduling of the closing date itself depends on the availability of the buyer, seller, buyer’s attorney, seller’s attorney and the transfer agent. Because many individual schedules need to be coordinated, it’s always possible that the closing date will be scheduled for more than two or three weeks after receiving board approval. It usually takes six to eight weeks to get co-op board approval after submitting the board application. It takes four to six weeks for the board to review an application and schedule an interview. Once the board interview is conducted, it usually takes up to a week to receive a decision. The closing date is scheduled as soon as practically possible, which is usually within a few weeks of receiving the official notice of board approval. The timeline for co-op board approval varies from building to building and can also be impacted by the time of year, specific real estate attorneys on the transaction, and personalities of the buyer and seller, among other factors. In this case study, the board takes 3.5 months to review the application and invite the buyer for an interview only to reject the buyer shortly thereafter. The buyer submitted his completed co-op board application less than 4 weeks after signing the purchase contract. The building is a large, 200+ unit co-op in the West Village. The building has a very unique application process which requires the buyer to submit the application itself in two separate phases. The buyer is first asked to submit his financial information. Once the board reviews the applicant’s financials, the buyer is asked to submit his reference letters. During the financial review, the board requested some additional financial information which the buyer provided in a timely manner. Thereafter, neither the buyer’s agent nor the listing agent received any update from the managing agent for months. After nearly three months of silence, the buyer’s agent contacted the managing agent requesting an explanation. The managing agent explained that the board was very busy since there were multiple apartments in the building ‘in contract’ at that time also undergoing board review. The buyer was finally called in for an interview three months after submitting his completed application. Subsequent to the interview, the buyer’s attorney was advised by the transfer agent that the applicant had been rejected by the board. To make matters worse, the managing agent didn’t even bother to tell the listing agent or the buyer’s agent directly that the buyer was rejected. Are you outraged by this story? Although the vast majority of co-ops are well behaved, there are always examples of co-op boards who engage in inhumane and unethical behavior. Fortunately, some counties in NY are taking legislative action against co-op boards. Rockland County recently passed a law which automatically approves a co-op applicant if the board does not issue a written decision within 45 days. In this case study, the co-op takes six weeks to approve the buyer after the board interview. The buyer submitted her co-op purchase application within three weeks of having a signed contract. The building is a self-managed brownstone in the East Village with less than 15 apartments. Because the building is self-managed, apartment owners hold varying responsibilities such as serving as the treasurer/accountant and transfer (sale) agent. The board reviewed the application and invited the buyer for an interview within six weeks of receiving the application. Although this is not the fastest turnaround, it is within the generally acceptable range of 4-6 weeks for NYC. Boards typically accept or reject applicants within a few days of the interview, and in some cases they take 24 hours or less to make a decision. In this case, the board took six weeks to issue a notice of acceptance to the applicant. Can a Buyer Back out of an Accepted Offer in NYC?